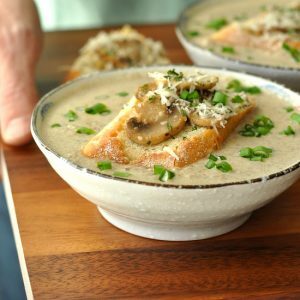 This restaurant-style Creamy Mushroom Brie Soup with Garlicky Mushroom Bruschetta is one of the most delicious way to eat your veggies! Though I have two amazingly scrumptious mushroom Brie soups already on the blog, my husband insisted I needed a third. My first was a brothy, buttery version of the classic while the second was thick, creamy, and swirled with pureed white beans. This one? This soup was all about the cream! Paul was craving a big bowl of restaurant-style mushroom brie soup, and when your meat-loving husband requests a vegetarian dish? Game on! Done deal! Let me at that Brie! While I know many of you are on the fence about your fungi friendliness, I have to admit that we’re totally team mushroom over here. If you love them too, here’s another shroom-tastic soup for your repertoire! First set out your dairy so they can begin to reach room temperature. This way you won't be adding cold cream + brie to hot soup and the soup will cook a bit faster. In a large pot, melt 1/2 tablespoon of butter and saute celery and onion until tender and translucent. Add 12 oz of your favoite mushrooms [wild or domestic] and another 1/2 tablespoon of butterl. Once the mushrooms begein to give up a bit of their liquid, add pinch of salt and the garlic. Cook for a few minutes to brown the mushrooms. I then scooped out 1/2 cup of cooked mushrooms from the pot to add to the soup later, if you'd prefer to puree all the mushrooms, feel free to leave them in. See notes below for three different texture options. Add 1/4 cup dry sherry *or* 1/8 cup apple cider vinegar and 1/8 cup water [as a sherry substitute'] and bring to a boil on medium high. Next add 2 cups veg broth and cup half and half and bring back up to a boil, then reduce heat and simmer on medium-low for about 10 minutes. Blend using an immersion blender until smooth then add reserved mushrooms. No immersion blender? No problem! Remove the soup from heat, allow to cool a bit and then puree in small batches in a food processor or blender, then add back to the pot. After adding the mushrooms, bring the heat back up and cook for about 10-20 minutes. Stir in the brie and heavy cream and simmer for an additional 10 min. Recipe yields 2 entree-sized portions (perfect for lunch!) or 4 small bowls as a side to your favorite meal or sandwich! There are three delicious ways you can make this soup: You can puree the entire batch making more of a creamy bisque, you can make it as written, with a combination of pureed and sliced mushrooms, or you can saute the mushrooms on the side and scarf a creamy brie-based soup flecked with sliced shrooms. No matter how you slice it, pureeing mushrooms always leads to great texture that reminds me a little of eating oatmeal or super-soupy cheese grits, if you'd rather the soup portion of your soup be completely creamy, I highly suggest option three. All you'll have to do is saute the mushrooms in a skillet and then add them in after you puree the onion and celery into the broth, easy peasy! 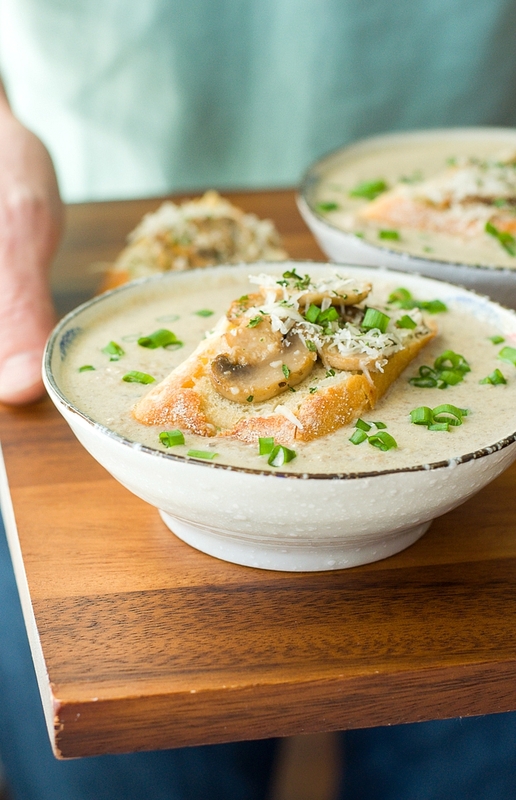 Whichever method you choose, the mushroom brie flavor of this soup is fantastic! Enjoy! The soup itself is gloriously gluten-free but in case your a baguette addict, grab your favorite crusty bread and use the remaining mushrooms to make toasty crostini perfect for dunking. UPDATE: I’ve recently found the most delicious brie that comes in a little triangle container and is completely rind-free! It’s actually more affordable and since you’re not paying (by weight) for the rind. Even better? It goes on SALE, making it a total steal of a deal! Yes please! Grab a freshly baked baguette (I always have a few frozen in my freezer for such occasions, it’s such a convenience!) and, slicing at an angle, cut off four slices. Toast if desired or leave fresh and fluffy, both ways are awesome! Saute 4 oz of mushrooms in a little bit of butter with minced garlic and a pinch of garlic powder and, once tender and perfectly browned, add to the bread. Grate some fresh parmesan on top (mozzarella or extra brie works too!) and serve alongside your soup. They’re perfect for dunking! I’m pretty convinced Paul needs to make meal requests more often. 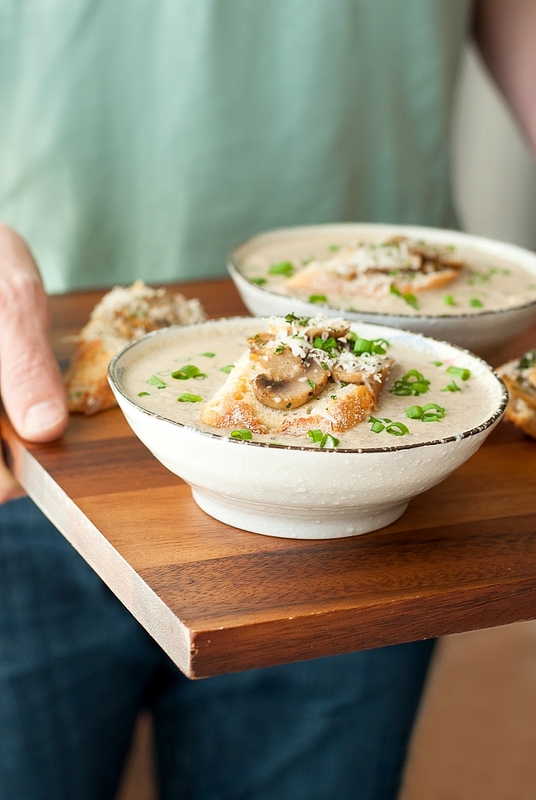 This mushroom brie soup was just what we needed to empty the crisper and fill our faces. This indulgent soup kept us deliciously full til dinnertime and was oh-so-tasty! Hope you love it too! 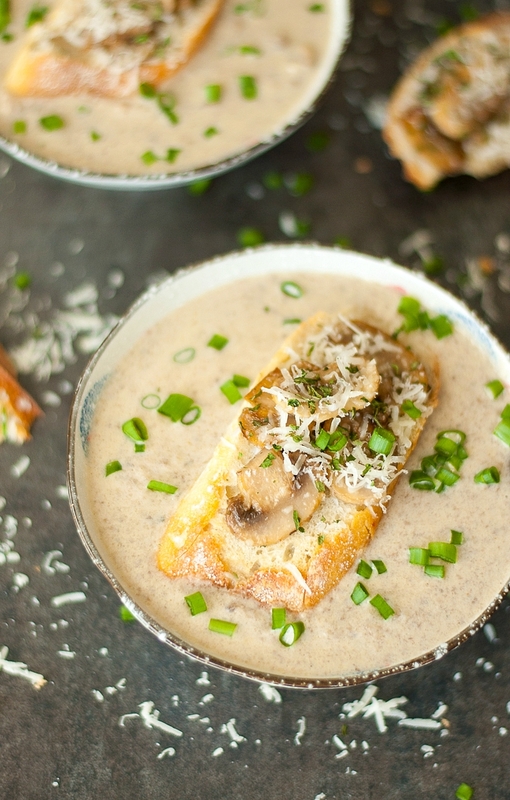 If you get a chance to try this creamy mushroom brie soup recipe, let me know! Leave some love in the comment form below or tag your photos with @peasandcrayons on Instagram so I can happy dance over your creation. feeling like a SOUPer star? This soup looks so earthy, and fresh. I love mushrooms so much and always looking for creative ways to cook them. This soup looks so creamy and thick! It’s crazy luxe, we love it so! It’s probably the only soup my husband outright begs me to make on a regular basis! Thanks Tatiana! Mmmmm. I wish I could make this right now! What would be another cheese that you could use instead of brie? Pregnant and I was told to not eat brie.. but this soup looks so yummy. Hi Dawn! Absolutely stay away from any unpasteurized cheeses while preggo! Many types of Brie that you’ll find at grocery stores are actually pasteurized for food safety (yay!) but if you still would like to avoid it (I totally get that!) you can absolutely use Mascarpone cheese, creamy Havarti cheese, or possibly even Gouda (the regular kind; not smoked) – the mascarpone you can use as is since it’s very similar to cream cheese in consistency but for the Havarti and/or Gouda simply shred using a cheese grater. I hope you love the soup as much as we do! Let me know which cheese you end up trying! Good soup but was a little disappointed with the yield. Would definitely not feed two men as a main entree. Nonetheless good. Will be sure to triple recipe next time. I’m drooling over my keyboard as I type, seriously! That looks absolutely amazing, especially since I love brie (typically with honey and chocolate). Jenn this looks amazing. I’ve been craving mushroom soup for weeks but can’t quite put my finger on the recipe I want to use. This sounds Like a serious winner! I’m right there with you and Julie – totally all aboard the fungus train!!! Can you believe I’ve never made shroom soup? This must change! PLUS bring on the cheese, puh-lease! !